A cousin of mine has a successful GM dealership and knows how to enjoy the fruits of his many years of labor. His house, perched atop a hillside near Sonoma, California, is well appointed. Upstairs, it is custom designed and decorated — real Home & Garden stuff. Downstairs, it’s everything you’d expect a gearhead’s man-cave to be. The 20-seat home theater, with plush leather recliners and the latest in audio-visual equipment is nice, but for serious wow, you can’t beat his 1500-square-foot garage. Within, crouching on immaculate checkerboard linoleum, next to massive stainless-steel tool chests, rest a pair of beautiful ’60s muscle cars and a late-model Ferrari. The cars, of course, are cleaner than Howard Hughes’ toothbrush. How does he keep them so clean? I’m guessing professional detailers go to his house regularly, or he has his lot-monkey arrange it when he drives one of his beauties to work. Such are the perks of being in automotive sales. Or maybe he likes washing his own cars. If I had a Ferrari I’d probably take it into the shower with me. That is not my life. I hate cleaning motorcycles, and my motorcycles probably hate me, as I wash them once or twice a year. Sometimes I forget what color the wheels are. 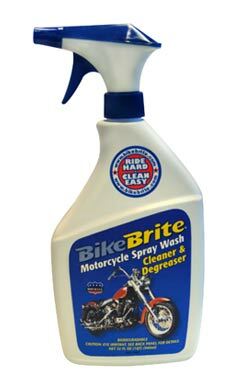 So Bike Brite Motorcycle Spray Wash may be a product for me. “Fantastic triple-action cycle formula washes-cleans-degreases,” promises the label. “Brings new brilliance to painted surfaces. Adds sparkle to brightwork, wheels and trim. Imparts a rich luster to vinyl, rubber and tires … biodegradable … approved by leading motorcycle manufacturers.” Holy crap! Does it cook you breakfast and buy birthday presents for your spouse also? I was suspicious of a product that claimed to do so many things at once, but I had a BMW test bike I had to return (and you do not want to bring a BMW back dirty, trust me), and not much time (or motivation) to do a really good job cleaning it. So I wet the bike down, sprayed the cleaner all over it, scrubbed at the greasy bits with an old toothbrush and soft scrub pad, and rinsed it off. Ha! It didn’t really work that well — the bike was clean, but not as spotless and shiny as the label promised. Oh, wait — the label has directions on it. And the directions tell you to spray the stuff on a dry bike and then to immediately rinse it off. But how could that possibly work? Smelling a Pulitzer, I decided to do some investigative journalism; pulling out my criminally filthy Ducati Supersport that I hadn’t cleaned since last October (I mean, why wash a bike if it’s just going to get rained on, right?). I spritzed the Bike Brite and rinsed it right off. It took two minutes. The following silence was the Pulitzer committee not calling me. After a quick chamois-ing, my bike was (almost) spotless. The painted and metal surfaces gleamed. The tires and other rubber bits sparkled. From 10 feet away, it looked really good. Closer, I could see some really hard-to-clean areas the Bike Brite couldn’t work its magic on, like the greasy residue on the wheels and splash from the chain. Still, if you want to clean your bike in two minutes, this is a remarkably effective product and definitely worth the $10 or so (the price varies from retailer to retailer and there is no MSRP on the manufacturer’s site, so shop around) for a 32-ounce spray bottle. You can find out where to buy it (and a lot of other bike-cleaning products) at Bike Brite’s website. Or you can just buy a car dealership. I tried this stuff (after winning it as a doorprize) on one of my older bikes and it was terrible. It seemed to get into the wax/polish that I had on the painted parts, my older (factory) black powdercoated frame was chalky and had spots, same with the aluminum. It took me many many hours to restore all the different finishes. I promptly threw the bottle out. Perhaps it’s fine on newer finishes, I don’t know, but I’ll not use it again as it was much too harsh. I used this product and S100…they work great but S100 is a little more powerful and it make your bike smell fresh lol…. Griot’s Garage sells every conceivable cleaner, wash, polish, wax and drying product you need for your cars and bikes. They work and will not harm your painted or unpainted surfaces. I have no relationship with the company other than as a satisfied customer. Griot’s products are not cheap, but then neither is my investment in my vehicles. Simple Green and other “purple power” type products are not safe for aluminum. They can etch the surface and the labels warn of this problem. Both products are banned from aircraft. I find Simply Green to be a very effective cleaner. I feel like I just woke up in the middle of an infomercial. Does it remove dried on bug guts? I have a FJR that usually has several layers of dried bug snot on it before I concede that it needs washing. If it works on removing these bug remnants, I’m sold! I may have had to scrape the really crusty parts with a thumbnail, but yeah, it worked pretty good. Hydrogen Peroxide works great to remove bug guts. Spray it on with a Dollar store spray bottle and wash and wipe off. It also seems to work just as well diluted a bit, so the 32-oz bottle could go further than one might think. Good stuff.